Get the heart racing with the revving of engines and the free-falling sensation of jumping out of a plane with our Adventure Sports certificates. No mountain too high, no car too fast, there is something to excite the thrill seekers out there who love to take their adventures to the next level. Head out of the big smoke and get down and dirty with an offroad quad biking adventure or test out those reflexes with a speedy rally car experience. Reach for the sky with heart-stopping skydiving over scenic beaches or for a slightly tamer flight, learn how to be a pilot for a day with flight lessons. What unique adventure activity will you choose? A great gift for anyone! The ride is Sydney's most popular jet boating adventure on Australia's most exciting jet boats. Passengers will experience fish tails, wave riding, power brake stops and incredible 270º spins. The thrill ride is an awesome 30 minute high-speed jet boat adventure, departing from the Eastern Pontoon Circular Quay. Every hour, every day from 11am until sunset. The ride is Sydney's most popular jet boating adventure on Australia's most exciting jet boats. A great gift for any couple! The ride is Sydney's most popular jet boating adventure on Australia's most exciting jet boats. Passengers will experience fish tails, wave riding, power brake stops and incredible 270º spins. They will see Sydney's famous sites including the Opera House, Fort Denison, Rose Bay, Goat Island, Taronga Zoo, Sydney Harbour Bridge and much more. At speeds of up to 80km per hour, not only will they feel the wind in their hair, but the adrenalin pumping through their veins. It's extreme and loads of fun! A great gift for the entire family! The ride is Sydney's most popular jet boating adventure on Australia's most exciting jet boats. Passengers will experience fish tails, wave riding, power brake stops and incredible 270º spins. At speeds of up to 80km per hour, not only will they feel the wind in their hair, but the adrenalin pumping through their veins. It's extreme and loads of fun! 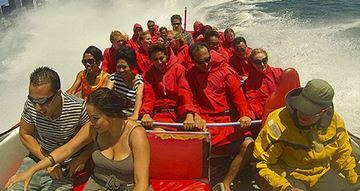 The thrill ride is an awesome 30 minute high-speed jet boat adventure, departing from the Eastern Pontoon Circular Quay. Every hour, every day from 11am until sunset.